Costa Coffee has partnered with Barclaycard to launch the UK’s first reusable coffee cup equipped with contactless payment technology. The ‘Clever Cup’, which will be available in Costa Coffee stores from this November onwards, is part of a wider relaunch of Costa’s reusable range that aims to encourage customers to avoid single-use takeaway cups. Powered by Barclaycard’s bPay technology, the Clever Cup harnesses contactless payment technology to turn the cup into a fast and convenient way to pay. Users can track their spending, top up their balance and block or cancel the contactless payment element using the dedicated bPay app or online. The cup’s contactless element is housed in a silicon base which is detachable, for ease of washing, and can be used wherever customers see the contactless symbol, not just in Costa Coffee stores. 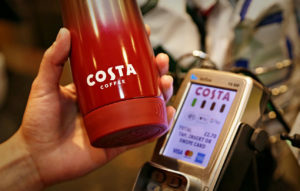 “Contactless technology has become increasingly prominent in our daily lives and through the launch of the new Costa/Barclaycard Clever Cup, we hope to appeal to those tech-savvy customers to help facilitate and drive environmentally friendly behaviour,” said Jason Cotta, managing director of Costa Coffee.